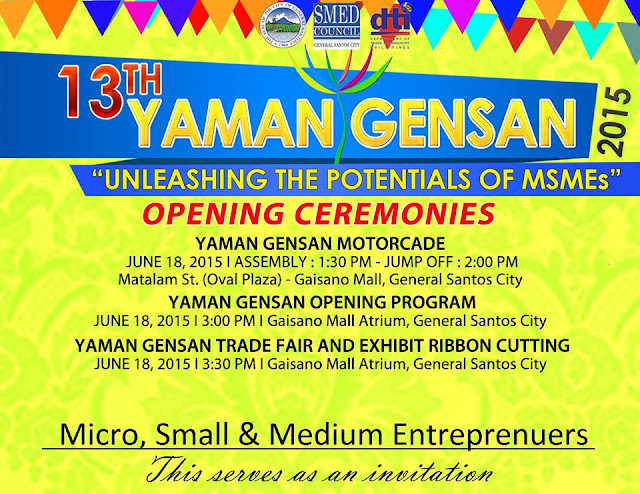 Once again the micro, small, and medium enterprises will take center stage with the YAMAN GENSAN 2015 or Yabong Maliliit na Negosyo sa GenSan, which is now on its 13th year with the theme, "Unleashing the Potentials of MSMEs". Micro, small, and medium enterprises (MSMEs) have a very important role in developing the local economy as they help reduce poverty by creating jobs for the growing labor force and stimulate economic development in the area. As of 2011 count, Mindanao has seen the growth of 31,561 MSMEs contributing significantly to the nation's economy, particularly in achieving equitable growth and sustainable development. YAMAN GENSAN is a socio-economic platform of the city government's Trade and Development Program. An annual month-long festivity filled with activities focused on encouraging, developing and improving entrepreneurial skills of MSMEs, thus, becoming the springboard of success of the city's young entrepreneurs. It stimulates and heightens business activities that brought in significant trade and investment impacts from local entrepreneurs in General Santos City. For YAMAN GENSAN 2015, limelight is placed on the vital role of the cooperatives and tourism sectors in the economic development of the city. Cooperatives are widely recognized mechanisms for fostering financial and economic growth in developing areas and are particularly effective in transitional economies, where there is limited access to capital and where vocational and technical skills are limited. YAMAN GENSAN 2015 intends to address critical challenges and constraints these sectors face today. Likewise, Gensan's Tourism sector is a complex service driven sector that is constantly evolving, the skills and knowledge required to operate a tourism business are pertinent to its success. It has an incredible impact on the economy by bringing in new markets for goods and services, increasing the area's visibility, while protecting the local environment and preserving cultural heritage. Fifty-two percent (52%) of YAMAN GENSAN activities are intended to capacitateour cooperatives while 20% is allocated for tourism related capacitating activities. Aided with substantial increase in total budget from the Local Government Unit of General Santos City and the General Santos City Small and Medium Enterprise Development Council, Inc. (GSC SMEDCI), YAMAN GENSAN has increased its number of activities by 35% with skills trainings and seminars posting a 55% increase compared last year. To strengthen work values & management of cooperatives on its role, a YAMAN GENSAN MSME Cooperative Conference and Exhibit is scheduled on July 2-3, 2015. The first Yaman Gensan Services Fair will be staged on July 17-19, 2015 to underscore the city's services industry with an outlook to promote their services and gain new business leads. In an attempt to truly unleash MSME potentials, this year's Yaman Gensan has placed emphasis in imparting free financial literacy activities as one of the thrusts in managing the hike and sustainability of these sectors. Financial literacy activities listed are Investing/Financing Forum, Practical Money Management & investment Strategies Seminar, and the Financial Management Coaching Workshops (Cashgen Approach). Yaman Gensan 2015 is made possible with the support of its cooperators from CEMCDO of the local government unit of General Santos City, DTI Gensan Office, DOST Region 12, BFAR Region 12, PESO Gensan, DOLE Gensan, RTWPB 12, and TESDA Sargen Office and partners from the private sector.